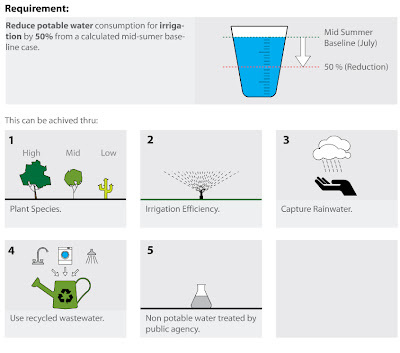 LEED Visual is a site based on the premise that the complex requirements of the LEED system could be better explained and understood through intuitive, diagrammatic graphics. This is a great concept, and I found some credit explanations particularly effective (e.g. the graphic explaining that you need to build above 5' above the 100 year flood plane for SSc1, Site Selection is instantly understandable, while whenever I try to explain this in classes someone inevitably asks a question about 5' below the the line...). Unfortunately, the site seems too basic at times, and there's nothing here (yet) that you couldn't otherwise find in the basic rating system documents. Also, at least one page features info that's misleading at best and wrong at worst (e.g. on the page for SSc4.1, Alternative Transporation, Public Transporation Access, the graphics suggest you're looking for stops within a half or quarter mile radius of the site, when it's actually based on walking distances). 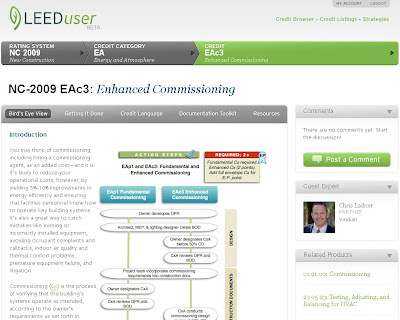 LEEDuser is currently in beta and is being developed by the fine folks over at BuildingGreen. The basic goal is to move beyond the reference guide to provide support for LEED AP's, including samples documents and templates (e.g. OPR and BOD templates for EAp1, Fundamental Commissioning). If they did nothing other than provide those templates it would be worthwhile, though the site aims to go much further by using seasoned professionals to provide practical explanations of how to actual go about finishing the credits. Though they plan on charging a membership fee in the future, for a limited time the site is open to all. Right now only selected credits are released, though ultimately the site is designed to support all major systems, integrate with their GreenSpec product directory, and provide a "strategies" section featuring topics such as green roofs and porous paving. If you've been a long time reader of this site you might remember that I think these guys are top-notch, and what I've seen on the site so far gives me no reason to expect anything less from LEEDuser. It's certainly not perfect (the "Getting It Done" section in each credit could be better organized), but the fact that there even is a "Getting it Done" section lends support to the fact that they're on the track. 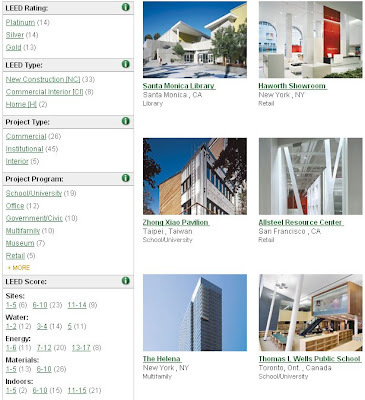 The profiles on the Green Building Project Database from GreenSource are similar to sister publication ArchRecord's Building Types Study database, but for LEED projects. Each project features photos, total costs, climate data, product info, a magazine-style narrative (go figure), and frequently a bunch of snarky, whiny comments from perfectionist architects and designers near the bottom. Honestly there's not a whole lot that's new here (see similar EERE database), but it's always nice to have more projects to choose from. My favorite aspect of the site is are the multitude of browsing bars along the left side of the screen that are organized through conventional topics such as project size and building type and more interesting categories like annual purchased energy, carbon footprint, and climate zones. Maybe not worth checking out right away, but definitely a good place to visit when looking for ideas. This last site is better as a magazine than an interesting website. 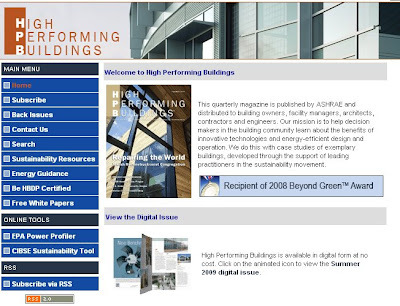 High Performing Buildings is an official ASHRAE publication and the website version is pretty much what you'd expect from a bunch of engineers: clunky, with a confusing interface, but featuring rock solid content. One of these issues landed on my desk a few months ago, and I've since subscribed (free to the trade). Most of the articles are in-depth profiles of a high-efficiency system installation or building component. There's nothing really specific about LEED here, but as someone trained as an architect I appreciate the easy to understand descriptions of complex mechanical and electrical systems. I've been impressed with the features and writing here and look forward to more in the future. The website is kind of pathetic, but that's not really the point. Since this quarterly publication was first released last year, it's not like to it's too difficult to find an older article anyway. The magazine is well put together, and even though it's probably not the most eco-friendly thing to recommend I would suggest sticking with the hard copy. Aware of a good resource I missed? Share with your friends by leaving a comment. Thanks for the great post Joel. Hi thanks for educating about us about the LEED initiative and other good sites covering the topic. It’s nice to see progress along these lines and the approach taken by organizations and the different government bodies in implementing these requirements. We in http://climatarians.org are of course in the early stages of development of strategies and need more time to see the results of our efforts. These are great - especially LEEDuser. But, is there something like LEEDuser for Version 2.2?? Help!